Marc Bendavid (born June 10, 1982) is a Canadian film, television and stage actor. Bendavid was born in Toronto, Ontario, Canada, to a Belgian-born mother and a Moroccan Jewish father. 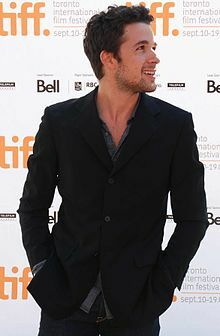 He attended Unionville High School and was subsequently accepted into National Theatre School of Canada, graduating in 2004. Bendavid played the role of Barbara Hershey's character's son Dominic Blythe in Anne of Green Gables: A New Beginning. He played the role Romeo in the play Romeo and Juliet. He has also appeared on the television drama Murdoch Mysteries and in thrillers, Too Late to Say Goodbye and Her Husband's Betrayal. Bendavid has guest starred in several of Canada's top series, including The Listener and Flashpoint, as well as recurring roles in Hard Rock Medical, Bitten, and Degrassi. Bendavid has appeared onstage including roles in Salvatore Antonio's play In Gabriel's Kitchen at Buddies in Bad Times theatre and Michel Marc Bouchard's "The Madonna Painter" at Toronto's Factory Theatre, and Arthur Miller's "A View from the Bridge". In 2014, Bendavid was cast in the role of "One" (a.k.a. Jace Corso, a.k.a. Derrick Moss) on the Canadian science fiction television series Dark Matter, which airs on the Space network in Canada (and on Syfy in the U.S.). The series debuted in the summer of 2015. He had a supporting role as Owen Thomas in Hallmark Original Movie Angel of Christmas. In 2016, Bendavid had a leading role as Phillip in the Hallmark original movie Summer in the City premiering August 13 on Hallmark Channel, opposite Julianna Guill with Maria Sokoloff, Vivica A. Fox and Natasha Henstridge. In 2017, he played the role of Cliff Baskers in the Hallmark original movie A Rose for Christmas opposite Rachel Boston. ^ Miller, Gerri. : "Jack Black, Paula Abdul and more: The Tribe takes over summer TV", Jewish Journal. June 1, 2015. Retrieved June 29, 2015. ^ "Alumni, Acting: 2000-2009". National Theatre School of Canada. Archived from the original on May 12, 2012. ^ "Anne of Green Gables: A New Beginning". anneofgreengables.com. Archived from the original on November 16, 2010. Retrieved November 13, 2010. ^ "Her Husband's Betrayal (2013) - Movie - Cast, Crew & Credits | Moviefone". AOL Moviefone. Retrieved August 14, 2016. ^ "One". Retrieved August 14, 2016. ^ "Like a Virgin". Torontoist. Retrieved November 13, 2010. ^ Donnelly, Pat (October 8, 2010). "Review: A View from the Bridge". Montreal Gazette. Retrieved November 13, 2010. ^ "Cast and Info". Retrieved August 14, 2016. ^ "Angel of Christmas Preview". TV Goodness. November 28, 2015. Retrieved August 14, 2016. ^ "Cast - Summer in the City | Hallmark Channel". Hallmark Channel. Retrieved August 14, 2016. ^ "Cast | A Rose for Christmas | Hallmark Channel". Hallmark Channel. Retrieved December 13, 2016. This page was last edited on 15 April 2019, at 20:13 (UTC).